With the citizens of Flint, Mich., still unable to drink tap water or take a shower safely, a Thursday House hearing featuring two principal players devolved into competing demands for the resignation of either the governor of Michigan or the head of the Environmental Protection Agency. The shouting about conflicting narratives on how Flint’s water became lead-contaminated also unveiled differing views on the role of an EPA whistleblower in the crisis and whether he suffered retaliation from federal managers. Chaffetz acknowledged that Michigan’s government “shares a big part of the blame,” but said EPA staff were serving on the state’s technical support team and yet they ignored warnings of lead in the water. He scolded McCarthy for “blaming the Bush administration” for a previous streamlining of the lead and copper rule and faulted EPA for delaying an update of the Safe Drinking Act. The governor’s narrative held that his department had assured him Flint’s water was safe, but it wasn’t. He cited “a systemic failure in a bureaucratic culture that values technical compliance over common sense.” He accused EPA of silencing a federal water expert who tried to raise the alarm in February 2015. Once the gravity of the situation was clear in October, Snyder added, he took immediate action, including switching water suppliers, conducting heath tests and finding $67 million for short- and long-term solutions. Several Republicans accused EPA of gagging and retaliating against EPA Region 5 drinking water specialist Miguel del Toral after he wrote a June 2015 memo warning of water contamination in three Flint homes. McCarthy disputed the allegations, saying that del Toral’s memo, though narrow, was immediately made public. “Miguel was the person everyone turned to, in no way did we sideline him,” she said. It was the Michigan department that spread the word he was a “rogue employee,” she added. McCarthy also complimented one of her fiercest critics in the episode, Virginia Tech professor Marc Edwards, whom she called “a good scientist” who has a contract with EPA. 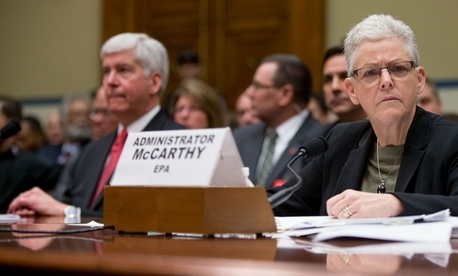 McCarthy laid out steps she has taken at EPA since the crisis erupted, including visits to the Flint community, requesting an inspector general’s investigation of the EPA response and a staffwide memo encouraging employees to come forward with safety warnings and send them up the hierarchy. Snyder asked those in the hearing room to “partner with me in fixing this, not just for the people of Flint” but before it spreads to other cities. “I’m going back to Michigan tomorrow to roll up my sleeves and keep going,” the governor said.